Insomnia? just a bad dream! Tired of staring at the ceiling for endless hours night after night? Frustrated because others can sleep without any problem? You’re definitely not alone as more and more people suffer from sleep disorders. Insomnia is caused most of the times by unhealthy habits which affect people’s ability to sleep. So this is why a few changes in your schedule should be enough to sleep again and to be more healthy and productive. –	Create a sleep schedule in order to wake up at about the same hour everyday. Waking up one day at 6 AM and the second day at 12 AM will do nothing but to affect you in a negative way. If your work schedule is flexible choose an hour to wake up and this will also allow you to do other things around the house or just to spend more time doing something pleasant. Spending six or seven hours five days a week in a group of 20 or even more people can prove to be a little tricky sometimes as conflicts become something regular. Especially as we grow up, they tend to become more complex and relations can be easily influenced in a negative way. Of course, sometimes you feel that you can’t take it any more. It’s normal, but remember that by having the right attitude from the beginning, you will find the hours you spend with the others pleasant and even relaxing. 1. When you are new in a group the best thing you can do is to meet the others, begin a conversation and introduce yourself. Still, try not to exaggerate and try to spend the first days noticing what the others like end dislike before getting too personal. Try to learn something about them before offending anyone by mistake. Try to keep the conversation neutral! 2. Everyone has their own role in a group. One can be the clown, another one the hard-worker and so on. Try to be as balanced as possible and to create an image of yourself. You mustn’t expose very much, but try not to create a fake image of yourself; it won’t work. If you are not the party starter don’t try to act like one, it’s ok. This is who you are and you should not try to change it or lie about it. Many people complain about having a phobia, but in reality, what they experience is a simple fear caused by the preservation instinct. A phobia is much more than this, as it’s irrational and can affect one’s life completely. But no matter how severe a phobia is, it’s not impossible to cure. However, this is not a matter of medication, as their effect lasts only for a short period of time, it’s a matter of will and of knowing yourself. Although there are strange fears such as the fear of snow, clocks, numbers or sitting which are less frequent, other fears such as the fear of being ridiculed, social phobias or the fear of failure can be found in many individuals. 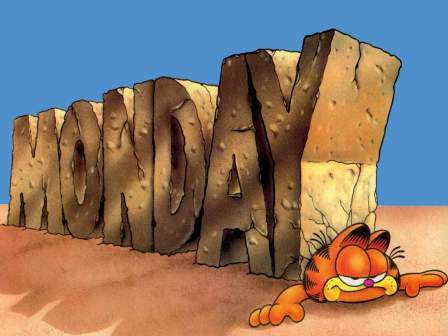 We all hate Mondays, that’s a fact. Just thinking about this day can cause head aches to any student or to anyone having a job. Maybe this is why this day is the least productive of the whole week. So how about a little change of attitude in order to be more successful? 1. Remember that it’s all in your mind and the way you see this situation affects all your behavior. So don’t spend your Sunday thinking about the fact that you will start work again, that you’ll have classes and that it will be hard to do everything! Be positive and optimistic about it as there is nothing particularly scary about a Monday. Smoke free! 10 ways of giving up smoking for good! What makes you start smoking again? Anger? Stress? Boredom? Tiredness? The first two are universally known to make people return to this bad habit. Each of these make you want to kill for a smoke, but cigarettes do nothing but to increase stress and to affect your health and even social relations. Learn to handle these situations and not to turn to cigarettes! 1. Take care of yourself! By depriving your body of smoking, assure that it won’t suffer because of this. Try to have a balanced diet and choose healthy, nutritious food. Ask a specialist about what you should eat and about what you should avoid. Fresh fruits and vegetables should help you the most! Give good quality “fuel” to your body and drink more water to be hidrated. Avoid drinks which have too many chemicals as you need to purify your organism. Take vitamins as nicotine has emptied your body of nutrients, in order to recover faster. Still, ask your doctor for a recommendation! 2. Give up caffeine! Drinking coffee in a time like this might make you nervous even angry so try reducing the quantity of coffee you drink every day. Even a simple coke can have unsuspected effects so you may even give up on it totally for a while. These two habits are usually associated so you may gain a lot more by forgetting about both of them! 3. Take a warm bath! It’s an excellent way to relax and to get rid of stress. Add just a little salt and it will be perfect! Relax and think about something pleasant. A little time spent like this everyday may bring even more benefits to both your body and mind.